Member & Guest Feedback Survey - Win a $100 Voucher! CONGRATULATIONS TO OUR JULY WINNER: JAMES G.
A NEW SURVEY ADDRESSING DIFFRENT AREAS WILL BE POSTED HERE SOON. CHECK BACK TO PARTICIPATE AND GO INTO ANOTHER CHANCE TO WIN A $100 VOUCHER! Our members & guests are what make our club. We invite you to provide us with feedback that we can use to improve service & offerings. 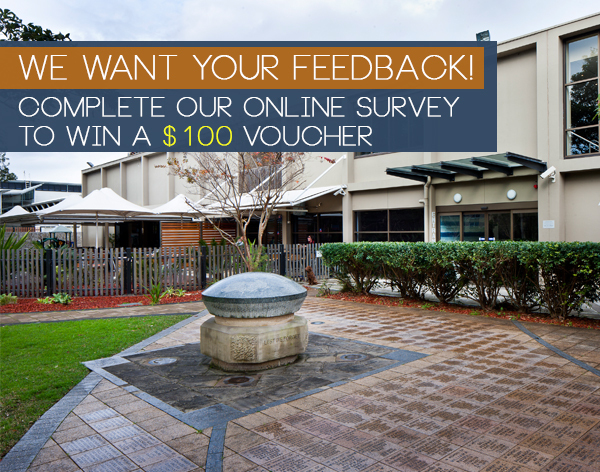 All survey participants who complete the feedback form will go into a draw to win a $100 voucher to be used in the club. ​The winner for the next survey will be announced on Monday 5th September. - All participants by be aged 18 or over. - All required questions must be completed to be in the draw for the $100 prize. - The survey results are anonymous, however contact details will need to be provided to go into the chance to win the $100 prize. - Prize is 10x $10 'Av Cash' vouchers to be used for food & drink purchases at Avalon Beach RSL Club. Vouchers expire 31/12/2016. - Winner selected by random number generator by club management (with a witness present) at 11am Monday 1st August at 1 Bowling Green Lane Avalon Beach NSW. - Winner will be notified via email & published on our website & Facebook page. ​- By participating you consent to Avalon Beach RSL Club publishing your name as a prize winner on the club website & social media.